My current fascination for reflections quickly shows itself in the photos I'm taking around town. 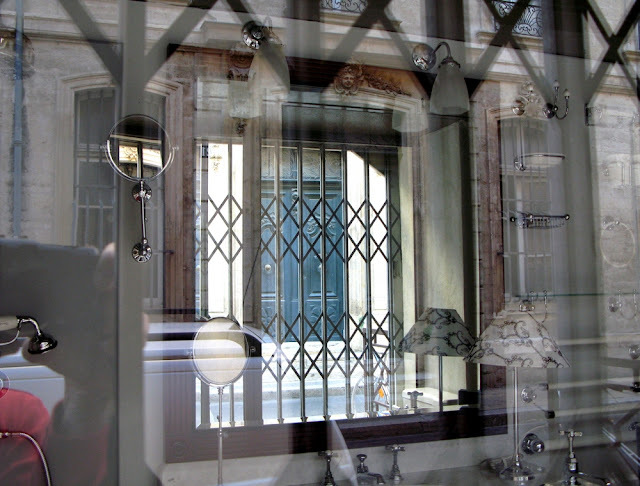 Strolling along rue Joseph Vernet I found many interesting shop windows. This old street is locally renown for its upmarket shopping. 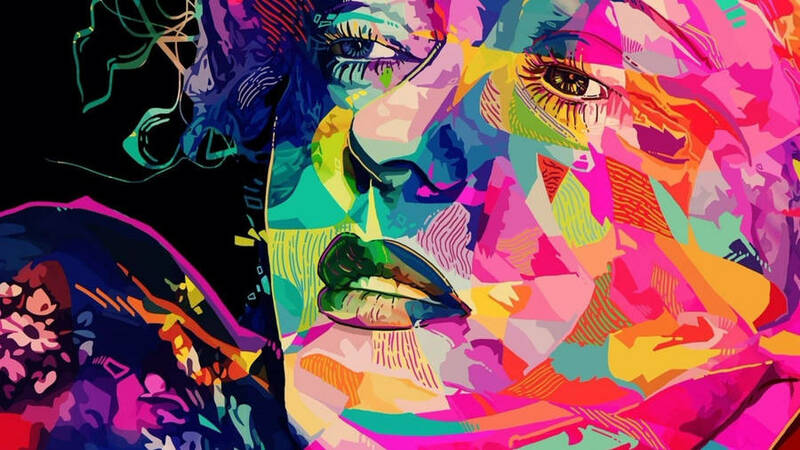 Look carefully at the photos, there's a lot to see. 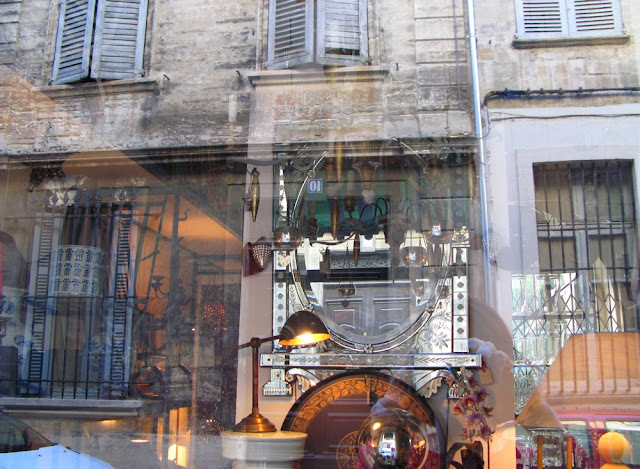 Here's an antiques shop, interesting mix of ancient objects inside the shop and reflections in the window of the old building across the street. 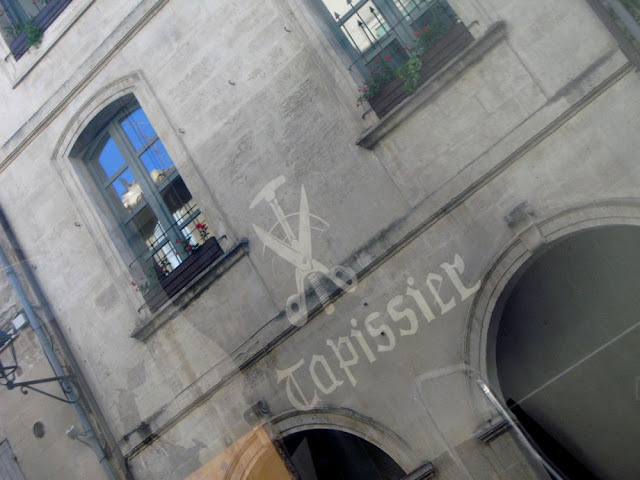 Further along, an upholsterer ('tapissier' in French) advertises with his tools of trade, cisors and hammer, engraved in his shop window reflecting the façade nd arcades across. Still closed at this early hour, a shop selling upmarket bathroom accessories, large mirror reflecting the street and the building across. 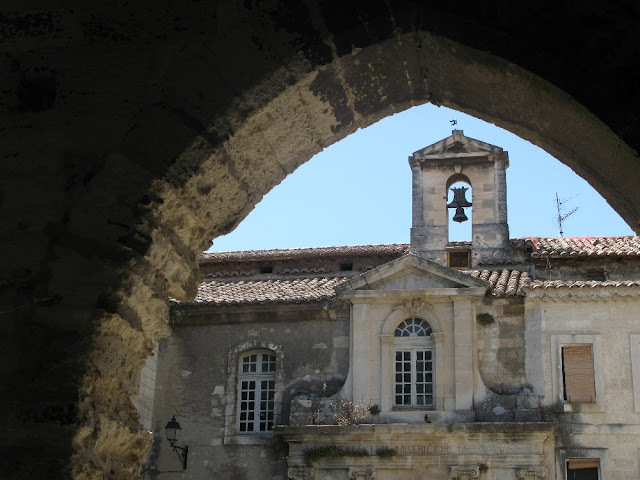 Here in Avignon and throughout most of France, shops open at 9:00 am, close at midday and reopen between 2 and 7 pm. The sun hasn't hit the street yet, hence the grey facades you see. Later in the day, the tones turn to blinding white at midday and golden hot in the afternoon - but that you will see another day. 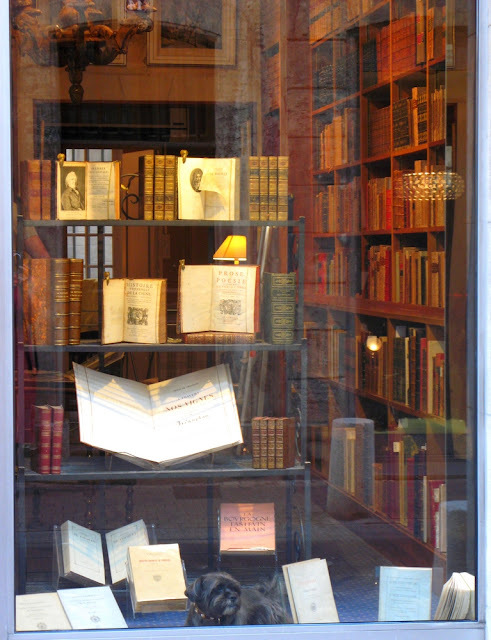 Last but not least, this bookshop specialising in old and rare editions. 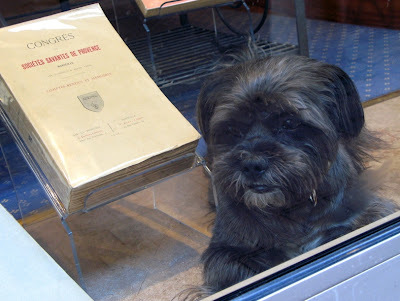 Look at the dog in the shop window, next to a book whose title is "Congress of the Learned Societies of Provence" (not sure which year?) - is this a learned dog too, has he read all the books? On a personal note: this weekend marks the end of the summer holidays in France. Tomorrow Monday 3rd September, my daughter goes back to school, her first day back in the French system after six and a half years of english-speaking schooling in Australia. I hope she adjusts well to the big change. This will be this year's challenge. Arriving in Avignon from Villeneuve on the right bank, I cross the river Rhone on the Pont du Royaume (the Realm bridge) and from there grasp my first view of the famous Pont d'Avignon (pont St Benezet) slightly upstream. 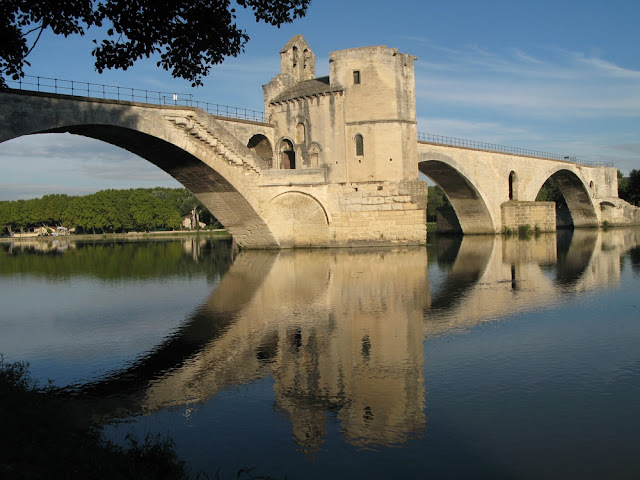 Did you ever learn the song "Sur le Pont d'Avignon" in French class at school? Well this is it. 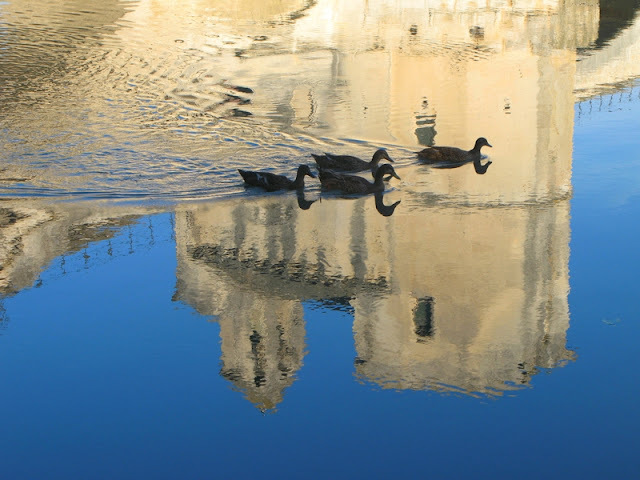 First built in the 12th century, it was partially destroyed by floods several times over the centuries and rebuilt every time, once more in 1628. But when the river washed away several arches again just five years later in 1633, the site was abandoned and a new location sought further downstream. In 1669 a new flood further destroyed the bridge and left it pretty much in the condition we know it today: out of the original 22 arches, only 4 remain. The river as you see it in summer may seem quite tame but think of the engineering challenge that men have faced over the centuries to build a bridge that would withstand the winter fury of this wild and large river and keep communication lines open! I can't help but get up early the next morning and visit the bridge at 8am, when the breeze hasn't picked up yet and the reflection is perfect. This bridge is such a tourist trap and a photographer's dream! Perfect reflection... until a small flock of ducks turns up under the bridge that is, and creates the first wavelets of the day. But soon enough I tire of the tourist stuff. Let me take you "intra muros" - "within the walls", inside the old fortified city, a fascinating maze of tiny streets. This is Rue Philonarde, the street where I will be renting a studio apartment for a month until l I settle permanently. Out of the many pictures I took today, I find this one quite significant: old walls and shutters, messy power lines and a bar with its typical tobacco sign watched over by a small corner statue of Virgin Mary. Religion and tobacco, mmmmh... neither is my cup of tea. Coming from Sydney, I am shocked to see the number of people who smoke here in France. Many of my old friends do. I had forgotten. Packs of cigarettes bear large 'smoking kills' labels yet parents appear unconcerned to see their teenagers become as addicted as themselves. I am grateful for the formative years my children spent in Australia. Neither of my 20 year old twins smoke. Will my 14 year old daughter get caught in this madness? Awareness of health issues and resisting peer pressure were two items often discussed at her school. I hope she makes good use of those skills here. 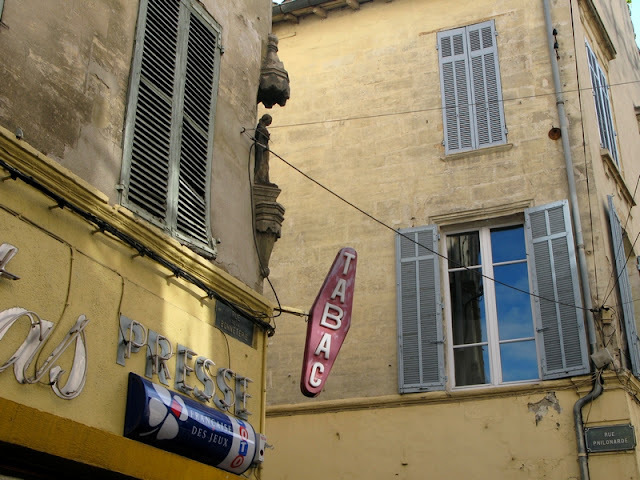 After more than six years of living in Sydney Australia, here I am back in Avignon where I lived for ten years. The old fortified city is familiar, I know my way through every back alley and narrow one-way street. How steeped in history this place is! Not a few steps without an old church in sight, an 18th century or medieval façade, a cobblestone courtyard or a roman tile roof. But we'll approach the city slowly, like pilgrims travelling on foot. 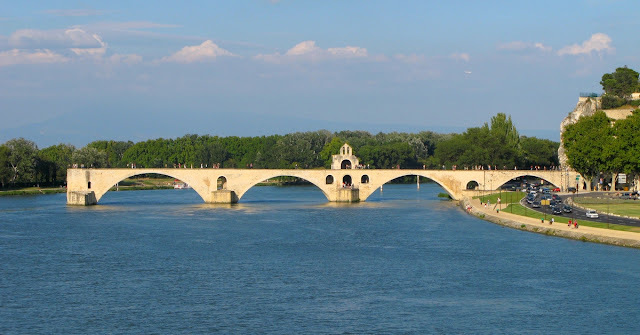 This isn't Avignon yet but Villeneuve-lez-Avignon, the long-time rival city accross the river Rhône. Smaller, quieter, more of a village really. 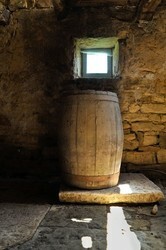 August is a wonderful time to rediscover the region. 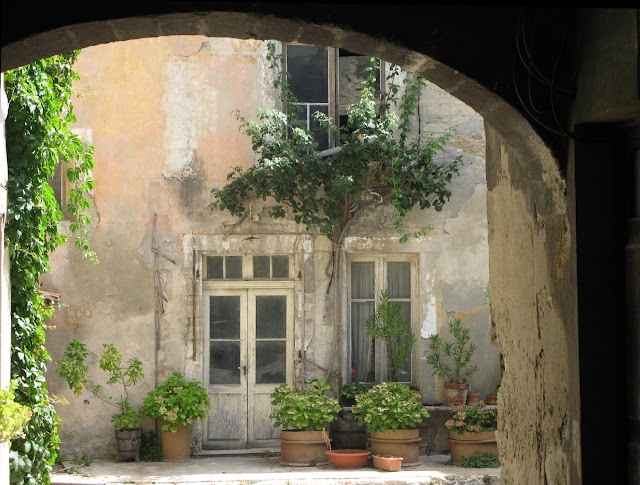 Warm summer days, balmy nights, flowers everywhere, grapes hanging from the vines shading the façades and blue shutters closed to keep the afternoon heat out: this is Provence, France's south, at nap time. The streets are empty, all shops closed, only a tourist like me would be out in the sun at that time of day! 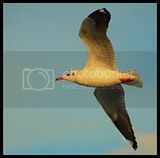 This first post will set the pace. 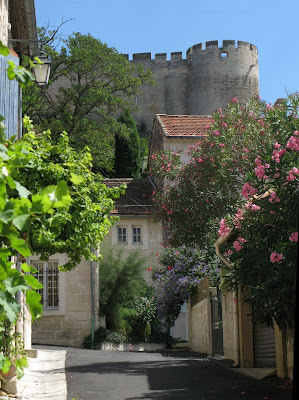 This is no Avignon Daily Photo, the rhythm will be slower. This is le Midi, the South, where doing anything with haste is considered bad taste. Here we will stroll rather than run. 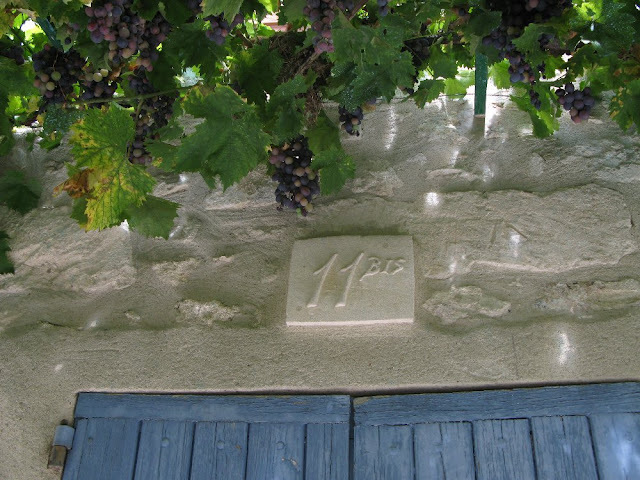 Take your time to look at my photos, and when you come back in a few days we'll cross the bridge to Avignon. I hope that those of you who enjoyed seeing Sydney through my eyes enjoy this new blog just as much. Welcome!